Japan’s New Energy and Industrial Technology Development Organization (NEDO) initiated the “Energy ITS” project in 2008, to evaluate methods of reducing CO2 emissions using Intelligent Transportation System (ITS) applications. The goal of the “Steering Control and Automatic Tuning to Compensate for Road Cant” project is to develop techniques for autonomous platooning of heavy-duty trucks to reduce their air resistance in expressway driving, thereby reducing fuel consumption and CO2 emissions. 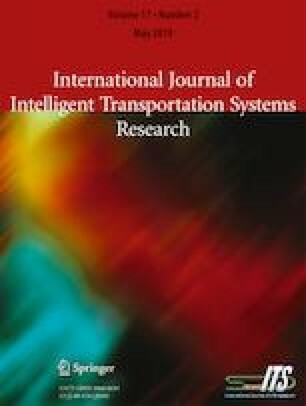 This study describes a steering control method based on path following, which uses feedforward control to respond to road cant. The output of the feedforward controller is used to maintain lateral control of the vehicle, turning the steering wheel to keep the vehicle within specified offsets of the ideal path. Experimental results that demonstrate the effectiveness of this approach are provided. The attainment of a low-carbon society in Japan requires mitigation of the energy and environmental impacts caused by the transportation industry. The use of Intelligent Transportation System (ITS) technologies to reduce fuel consumption and CO2 emissions is one approach to mitigation. In 2008, Japan’s New Energy and Industrial Technology Development Organization (NEDO) established the “Energy ITS” project to reduce CO2 emissions. This project is based on the concept that an autonomous platooning system  can operate on the existing road infrastructure and that platooning reduces both fuel consumption and CO2 emissions . Many studies have been conducted on autonomous driving and platooning [2, 3]. Although most methods require specialized road infrastructure, techniques developed in recent years have used the existing infrastructure in Japan, Europe , and the United States . In the “Energy ITS” project, the inter-truck distance is maintained constant at a short distance (4 m) to improve fuel consumption. The driver’s view is limited, and it is difficult for a driver to drive safely for a long time. Therefore, we proposed the lateral control method   based on path following and the longitudinal method  using front and rear information. The effectiveness of the proposed methods was demonstrated using a modified heavy-duty truck that was operated on a pre-service expressway without other traffic. 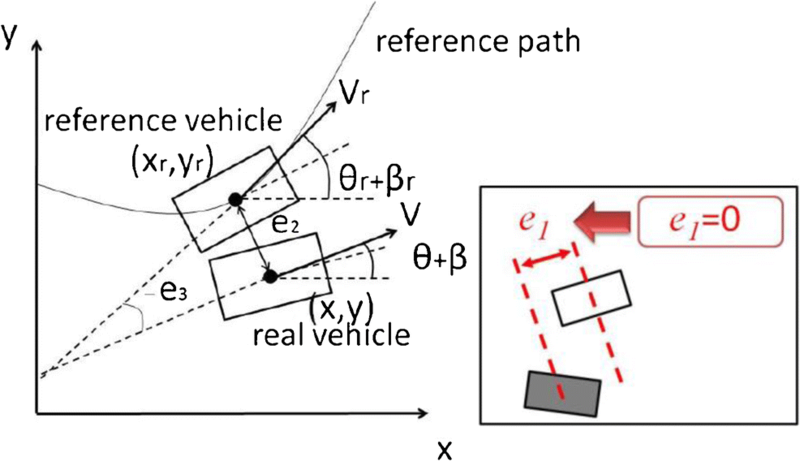 In this study, we describe a novel method to autonomously control a vehicle’s lateral direction. Because road cant can influence the performance of the controller, we propose a control mechanism using feedforward (FF) control to respond to road cant. The design of the FF control is based on the position of an inflection point using the knowledge of the position acquired from manual driving. If road information is not available or is inaccurate, it is not possible to determine the FF control parameter or the location of the road’s inflection point accurately. Therefore, we propose a method to self-tune the FF control variable by estimating the location of the inflection point from control results. The effectiveness of the proposed method is determined experimentally using an instrumented, heavy-duty truck operating on a pre-service expressway that has an S-shaped curve. Figure 1 shows the single-track model used to design the lateral controller. The single-track model is a vehicle motion model in which the four wheels are represented by two wheels located at the intersection of the longitudinal axis and front and rear axletrees (the centers of the axles). In this model, the motion is assumed to be in the horizontal plane of the vehicle, which is moving at high speed and constant velocity. The following three equations describe the dynamics: . where Kf and Kr are the cornering stiffness of the front and rear tires, lf and lr are the distances between the front and rear wheels and the vehicle’s center of gravity, M is the mass of the vehicle, β is the side slip angle of the center of gravity, γ is the yaw rate, V is vehicle velocity, and J is the moment of inertia. The control system  is designed to correct the real vehicle’s motion to follow that of a virtual vehicle on the reference path as shown in Fig. 2 . Japan’s expressways usually are designed for vehicles traveling 120 km/h. When a vehicle travels at a speed lower than the design speed, gravitational forces move the vehicle toward the low-side of the curved road. As the speed limit for heavy-duty trucks is 80 km/h in Japan, road cant causes disturbances in steering control. 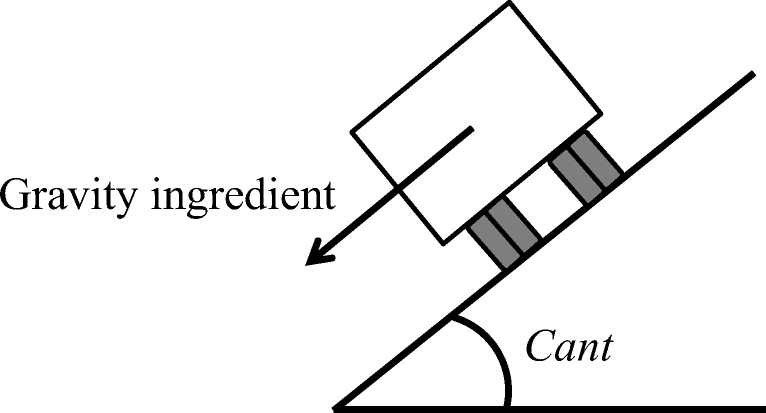 We propose a method to deal with the influence of gravity on a vehicle, as shown in Fig. 3, using feedforward control. When driving at a speed below the design speed, a driver steers toward the top of the road cant. When the direction of curvature and road cant change, a driver steers in the opposite direction before an inflection point. Because the legal limit for trucks is 80 km/h in Japan, it is necessary to react to the road cant. For this study, we designed the FF control to calculate a constant value for road cant as shown in Fig. 4. The direction of input of the FF control starts to change from 65 m before the inflection point (Curvature is 0). The direction of control input of the FF control changes 40 m before an inflection point. Parameter a in the FF control equation depends on a linear shape of a road and a velocity of a vehicle. The cant of a real road may differ from the specified cant because of construction variability and age-related deterioration of the road. In this study, the FF control is designed to adjust to road cant is based on an inflection point. Therefore, we propose to estimate an inflection point from control results. where Ps is an inflection point of a road cant from start point and Pm is the halfway point from the zero crossing point to the first peak point. It is not possible to determine the FF control value without accurate linear information about the road. Therefore, we propose a method to automatically adjust (“self-tune”) the FF control value. In this method, the FF control value is self-tuned based on the lateral error as shown below. A controlled truck runs without FF control, and the location of the inflection point is estimated. The initial value of the FF control parameter is set using the following conditions. If the first peak of lateral error is greater than 0.25 m, a1 deg. is added to parameter a of FF control. If a first peak of lateral error is between 0.2 m and 0.25 m, a2 deg. is added to parameter a of FF control. A controlled truck runs with FF control using new parameter a. If first peak of lateral error is greater than 0.2 m, steps 2) and 3) are repeated. 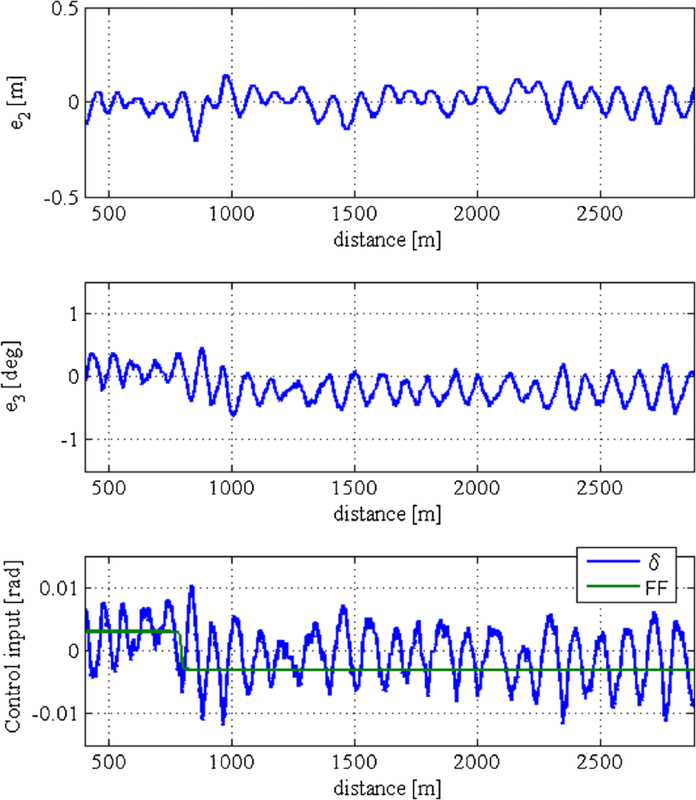 If the first peak of lateral error is less than 0.2 m, self-tuning is finished. We used the 25-ton-class truck depicted in Fig. 6 for this experiment. Although this truck has three axles, we approximated it using a single-track model with two axles. The vehicle parameters shown in Table 1 were measured on the 3-axle truck. The value of Kr for the 2-axle model was approximated from the 3-axle value. The truck has onboard sensors: a camera and a laser on the left front and the left rear to detect white line on road, a wheel-speed sensor, and a yaw-rate sensor. The lateral deviation e2 and the heading angle e3 are calculated using camera data  and laser data . The sensor data are sent to processors mounted in a dSPACE Autobox. The processor modules calculate the feedforward control input, which is sent via Controller Area Network (CAN) bus to the steering electronic control unit (ECU) and the engine ECU. The steering ECU controls a motor installed on the steering wheel. Table 2 shows the control gains of the lateral controller as a function of velocity. Control gains for other velocities can be obtained by interpolation. The test course is the tunnel section of a pre-service expressway that has an S-shaped curve as shown in Table 3. R is a turning radius, A is a parameter of a clothoid curve and C is a road cant. The controlled truck ran on the 2879 m long tunnel section. The inflection point is located 859.5 m from the start point. In this experiment, the test truck was run at 80 km/h with and without FF control. Parameter a of FF control was 2.65. Results of control without FF control are shown in Fig. 7. Results of control with FF control are shown in Fig. 8. In Fig.7 and Fig. 8, e2 is a lateral error, e3 is a heading angle error, and d is a total of control input of feedback and feedforward control. FF is the total of FF control input for curvature and road cant. As shown in Fig.7, the maximum lateral error is approximately 0.4 m near the inflection point of the S-shaped curve. Stationary error occurs after passing the inflection point. On the other hand, as shown in Fig. 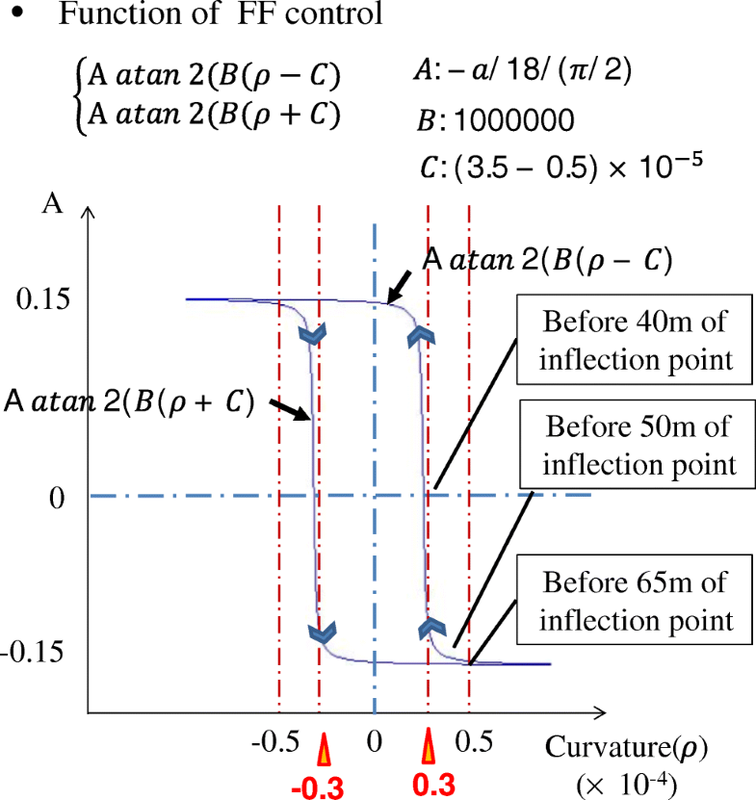 8, lateral error does not increase in the vicinity of an inflection point. The controlled truck could run with a lateral error of ±0.15 m, which was the accuracy objective of this project. Consequently, the effectiveness of the proposed method is confirmed. The experiments enabled us to estimate how accurately the inflection point was determined. The estimation results for five experiments at 60 km/h are shown in Table 4. The estimated error of the inflection point, the difference between the true and estimated positions, is shown in Table 4. As shown in Table 4, the inflection point was estimated with an error of less than 4 m. We confirmed that the proposed method has sufficient accuracy. 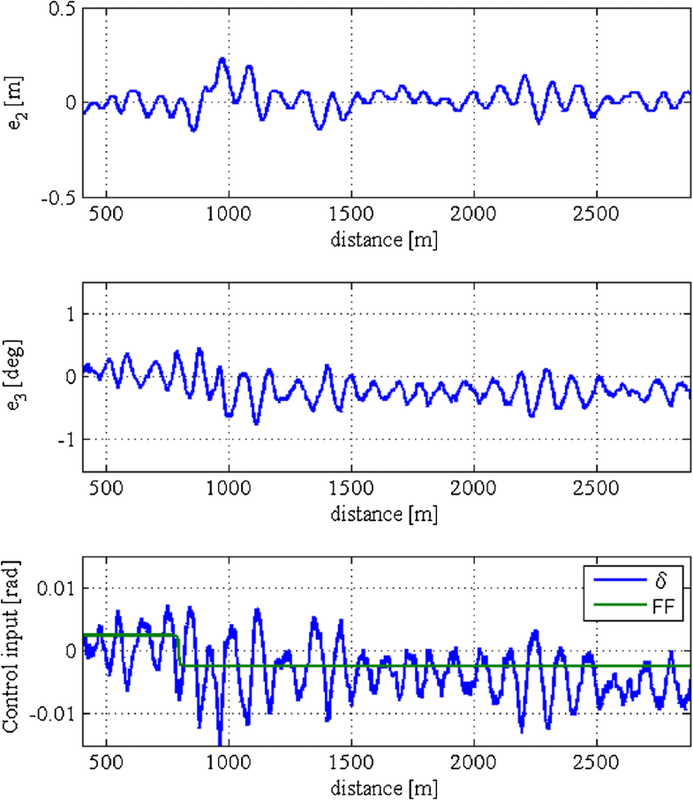 In this experiment, the proposed methodology was used to self-tune the FF control parameter. There were five runs with target velocities of 70 km/h and 80 km/h. The self-tuning parameter a1 was 1, and a2 was 0.25. 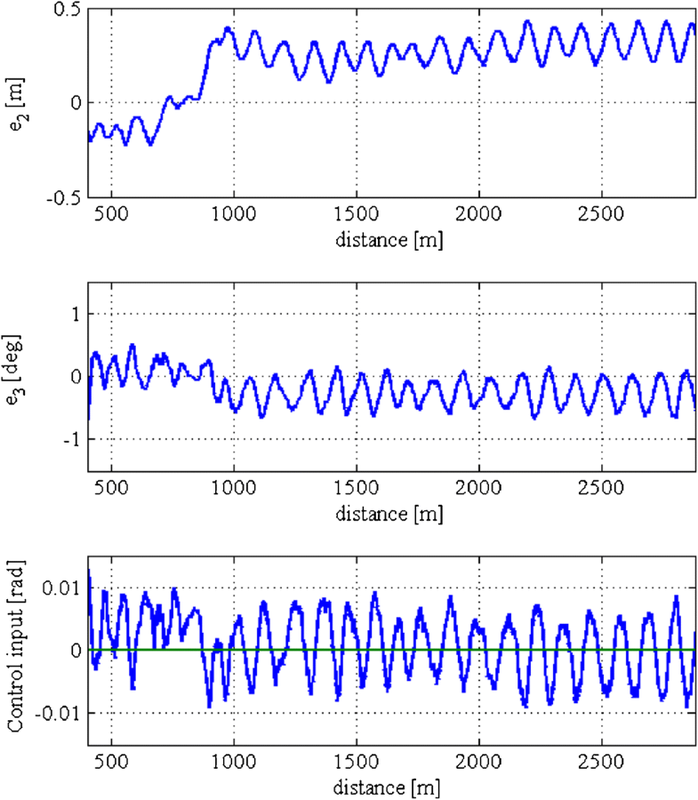 The experimental results for two runs at 70 km/h are shown in Fig. 9 and Fig. 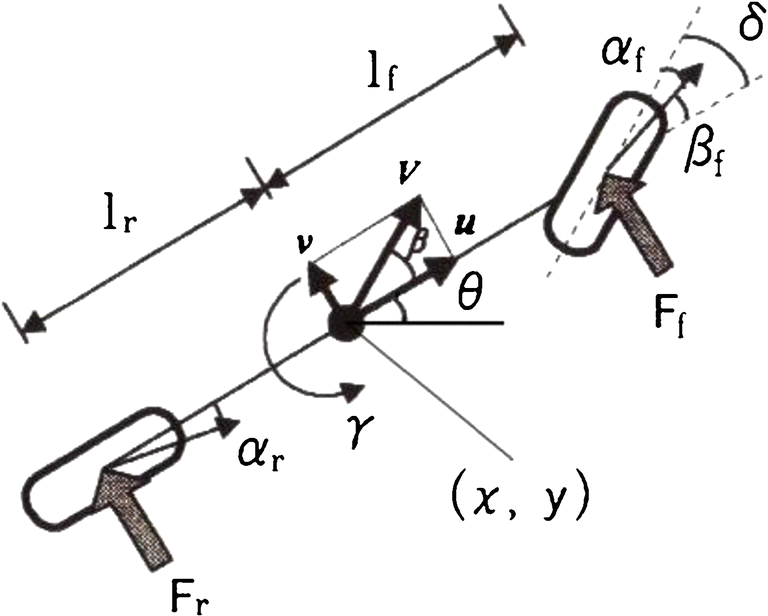 10, which show that the controlled truck could run with lateral error of ±0.2 m in the vicinity of the inflection point and a lateral error of ±0.15 m after the inflection point. The experimental results for three runs at 80 km/h are shown in Fig. 11, Fig. 12, and Fig. 13, which show that the controlled truck could run with a lateral error of ±0.2 m in the vicinity of the inflection point. 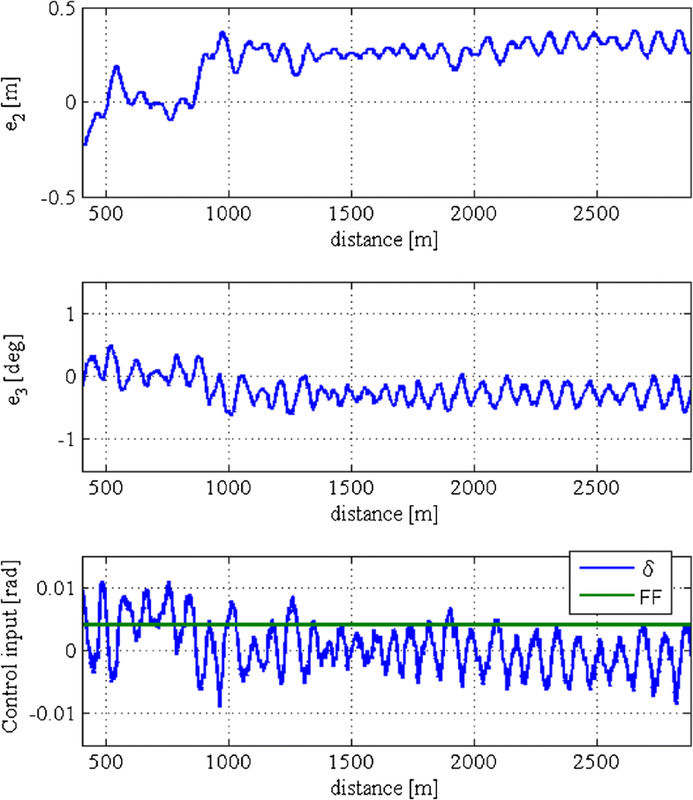 The results confirm that the proposed methodology self-tunes the FF control parameter with an accuracy consistent with the project’s objectives. 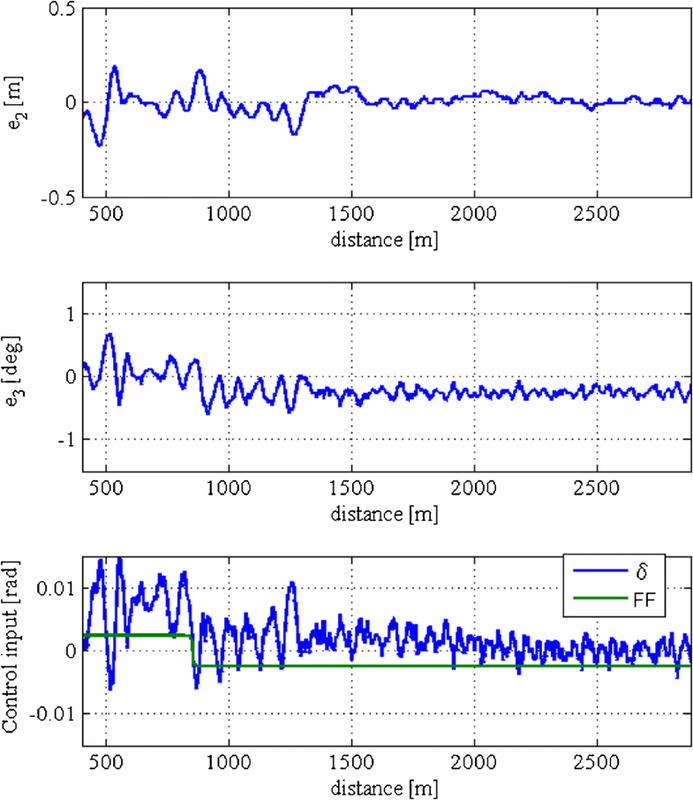 In this study, we proposed a control method using an FF control parameter to compensate for road cant. The FF control parameter is calculated based on the position of an inflection point in the roadway. We considered practical situations. 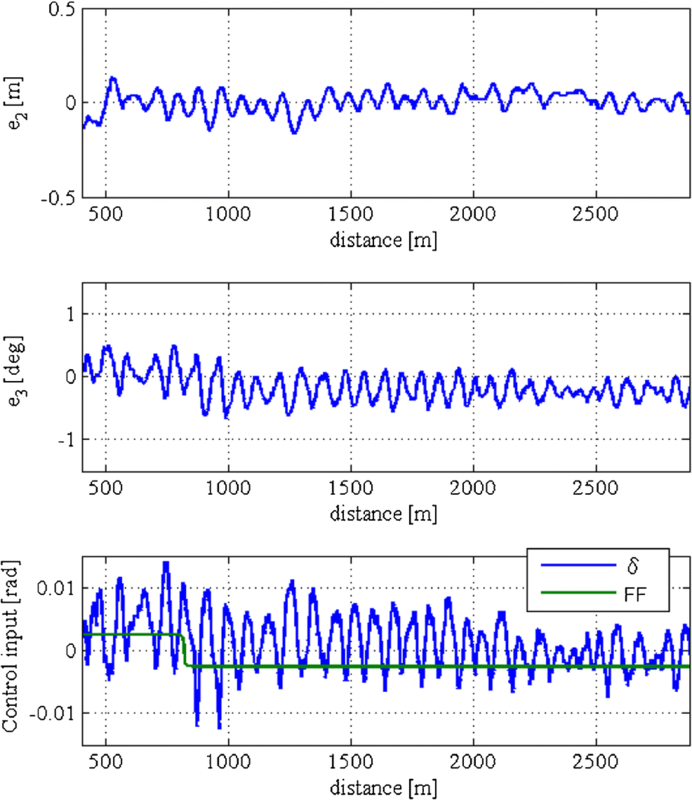 We also proposed a method to estimate the location of the inflection point from control results, and the self-tuning method of controlled variable of FF control. The experiments used a commercial 25 t truck, with additional sensors and processors, on a pre-service expressway to evaluate the proposed methods. The results confirmed that the proposed method was effective near the inflection point of an S-shaped road. The New Energy and Industrial Technology Development Organization (NEDO) supported this study.